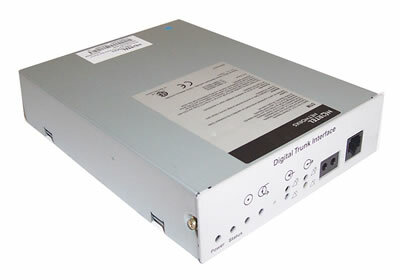 The Nortel BCM Digital Trunk Media Bay Module DTM connects to a standard digital PSTN T1/fT1, E1/fE1, or PRI ISDN line using either a digital or PRI line. Also supports DASS2, DPN22, Q.SIG, and MCDN over ISDN. On North American BCM systems, the DTM connects a T1 or PRI circuit to the BCM system; T1 circuits provide 24 digital channels to the PSTN, while PRI circuits provide 23 digital channels to the PSTN. The front bezel of the DTM has an RJ-48C connector that connects the DTM to the service provider connection point. The faceplate also has a set of monitor jacks you can use to monitor the span. The Nortel BCM Digital Trunk Media Bay Module connects to a standard digital PSTN T1/fT1, E1/fE1, or PRI ISDN line using either a digital or PRI line. Also supports DASS2, DPN22, Q.SIG, and MCDN over ISDN. On North American BCM systems, the DTM connects a T1 or PRI circuit to the BCM system; T1 circuits provide 24 digital channels to the PSTN, while PRI circuits provide 23 digital channels to the PSTN. The front bezel of the DTM has an RJ-48C connector that connects the DTM to the service provider connection point. The faceplate also has a set of monitor jacks you can use to monitor the span.